Everything you need to make nutrient-rich, good-for-the-gut ferments. 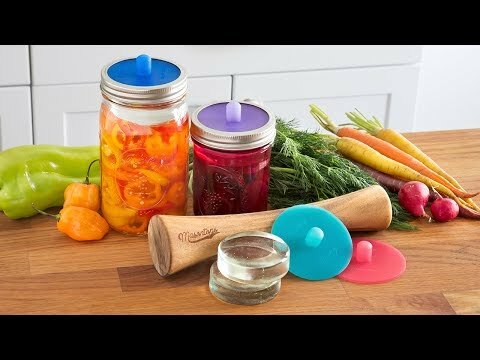 These mason jar fermenting lids screw directly to mason jars, keeping out air while also letting gases escape—so you don’t have to periodically burp the jar. 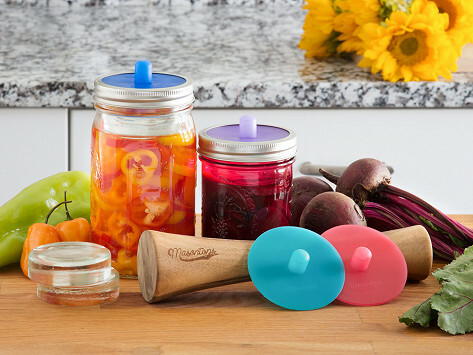 The kit also includes instructions, recipes, glass weights, and even a vegetable tamper to help release moisture from veggies directly in the jar. Dimensions: 12.1" x 9" x 4.6"
Easy and less expensive way to try fermentation. Simple to follow directions. Love it. This was given as a gift. He says he really liked it.